We decided we wanted to make purple potato knishes six months ago. Six months ago I lived in a different apartment, with a different roommate, in a different bourough. I had a different job. I had a different life. And yet. AND YET. These knishes haunted my dreams through it all. Okay fine, it wasn’t that dramatic. I thought about them from time to time. Do you know how hard it is to find purple potatoes in Manhattan? I didn’t. I was naive. I thought, oh certainly they must be sold somewhere nearby. All I have to do is run to my local organic grocer and I’ll find a whole crate of them. I couldn’t find them anywhere. They were listed on Instacart’s Whole Foods page, so I ordered them and received sweet potatoes. Tried again and got red potatoes. Tried a THIRD time (don’t look at me like that) and was told they were out of stock. Why not just give up on the purple potato dream and make standard, but still delicious, knishes? Because we were DETERMINED. And it was worth it, because when Alyssa finally got some purple potatoes in her CSA, they made a gorgeous knish filling fit for a mermaid. A Jewish, Lower East Side-based mermaid, granted, but I guarantee you they exist. 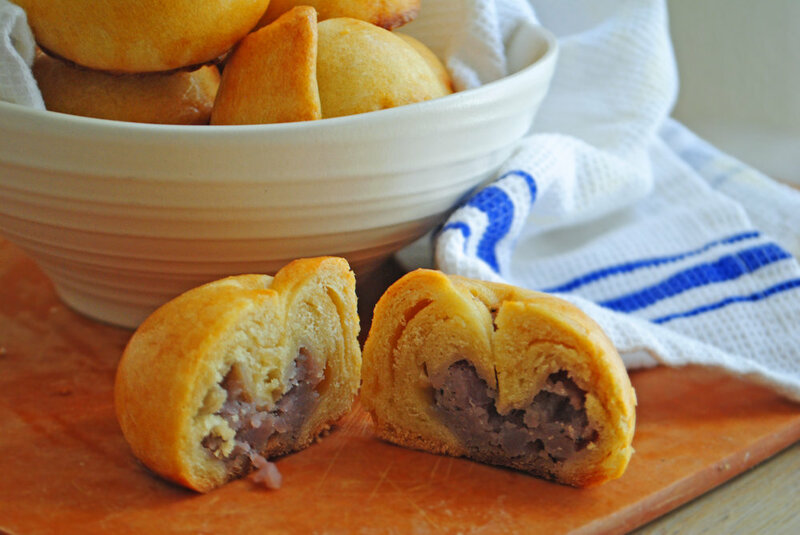 Of course you can make these knishes without the purple potatoes, but if you can find them then definitely use them. They’re just SO PRETTY. Whenever we’ve made a recipe like this, one that involves some spatial reasoning (see this pretzel grilled cheese and these Viennese kipfel, for example) I’ve openly opined about how, well, awful I am at it. This recipe is no different! There are a few steps that, at least for me, took some getting used to, but we’ve included a lot of pictures to help you out. After a bit of trial and error, a lot of mashing and rolling and a LOT of picture consultation from Joe Pastry, these beauties emerged from Alyssa’s oven. They’re flaky, comforting and downright adorable, and they are worth the time it takes to whip ‘em up. Sure, you could run to your local Jewish deli or bakery and grab a few, but if you make them yourself, you can shout from the rooftops or fire escapes how talented, albeit maybe a tiny bit extra, you are. And if you end up eating half a batch on your couch at 11 PM (which NO ONE in my house did), we won’t tell. Note: if you, like Rina, are horrific with spatial reasoning and general visualizing, use the pictures above as a guide. No shame. You’ve got this. *make sure to use potatoes that are purple on the inside as well as the outside - there are some fakes out there. Regular potatoes will work just as well if you can’t find any. Make the dough: in a large bowl mix together the flour, baking powder in salt. In a small bowl whisk the egg, vegetable oil, vinegar and water together. Pour the wet ingredients into the dry and mix together just until a craggy mass forms. Lightly flour a surface and plop the dough onto it. Knead JUST until the dough is smooth, maybe 15 seconds or so (my dough broke when I tried to knead it for longer). Place back in the bowl and cover with plastic wrap. Let it sit in the fridge for at least 1 hour, and up to 3 days. Make the filling, part one: add the peeled and quartered potatoes to a large pot, fill the pot with enough water to cover the potatoes and place on high heat. When boiling, reduce heat to medium and cook until the potatoes are pierceable, 20-30 minutes. Drain and transfer to a large bowl to cool. Make the filling, part two: while the potatoes are cooking away, add the oil and butter to a large skillet or saute pan and place over low heat. When the butter is melted, add the diced onion and cook until super caramelized, about 45 minutes. Stir every 7 minutes or so to make sure they aren’t cooking too fast or sticking to the pan. When deep brown and divine, add the onion to the bowl with the potatoes. Sprinkle in the salt and pepper and mash together. However many lumps you want in there is up to you. Oven prep: preheat the oven to 375F and line a baking tray or two with parchment paper. Form the knishes, part one: take out your dough - no worries if some beads of oil are peaking out, just knead them back in there. Flour a surface, plop the dough on there and divide in half, put one half to the side. Take the other half and roll it out really thin, so that you get a 1-foot or so square (weekly reminder that Rina is horrible at spatial reasoning and general visualization so rough is TOTALLY fine). For medium knishes (about 3 inches across) create a 2-inch log of purple potato along the bottom edge of the dough square. We made tiny ones so our log was smaller, so you do you. Roll the filling up (like a cigarette, says Deb) with a bit of slack, which keeps the filling from popping out in the oven. Cut away the excess dough from the log - if you have enough from this half leftover, repeat the process. If not, add it to the half of the dough you temporarily abandoned and repeat the process from roll-out. Form the knishes, part two: trim the ends of the potato log so there are no straggly bits. Make indentations on the log about 3 to 3 ½ inches apart and twist the dough at those points (as if you’re making sausages but, like, soy or whatever). Cut the dough at each twist and then pinch each end of the sausage piece to seal ‘em up. Use the palm of your hand to squish each knish down to get a squat shape. From here, you can either poke the top of the knish in its middle to make an indentation and close it up, or you can press down a little but leave it mostly open so that some filling peeks out. Up to you! Bake the knishes: place the knishes on the prepared baking tray(s) far enough so that they don’t touch, but not much farther - they don’t grow too much. Make the egg wash by whisking the egg and water together, and brush each knish evenly with it. Bake for 45 minutes, or until golden brown, rotating the pan halfway through to ensure even baking. Allow to cool slightly, then dig in. Spicy mustard on the side, like Deb explains, is traditional, and while not required it is highly recommended. To keep: I would love to tell you how long these last, but they didn’t make it through the night. The dough can be made up to 3 days in advance, and I imagine the baked knishes would keep in a tightly sealed container or bag for a few days. I doubt you’ll run into this problem, though.